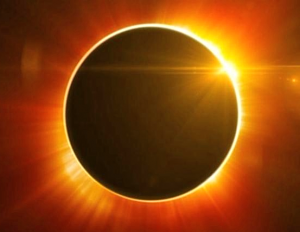 For those who missed Friday's column - see all you need to know tomorrow's Total Eclipse - including new links and apps on where and how to watch. Monday, August 21st, Americans from every corner of the country have the opportunity to see one of nature's most awe-inspiring sights - a Total Solar Eclipse! There are two types of eclipses seen from Earth - eclipses of the moon (lunar) and of the sun (solar). Lunar eclipses of the moon happen at night, and can be seen by half the world at the same time. Solar eclipses can only occur during a New Moon when the Moon moves between Earth and the Sun and the 3 celestial bodies form a straight line - Earth-Moon-Sun - blocking all or part of the sun. The three main types of solar eclipses include total solar, partial solar, and annular. Partial eclipses are when the Moon comes between the Sun and Earth, but the Moon only partially covers the Sun's disk. Annular eclipses, which are rare, happen when the Moon covers the Sun's center, leaving the Sun's visible outer edges to form a "ring of fire" or annulus around the Moon. A total eclipse is a rare and beautiful site. This will be the first time the contiguous United States has seen a total eclipse since 1979! #1 Animals getting confused: The change in light makes animals think and act like it is night. #2 Stars and planets in the middle of the day, as bright as they would during the evening! #3 Shadow bands: Right before a total eclipse, little snake-like shadows may appear to slither across the ground, caused by light from the eclipse being focused and refocused through air cells in the atmosphere. #4 Bailey's beads are pearls of sunlight shining through the valleys and mountains of the moon. You will see them around the edges of the moon as it passes over the sun. #5 Corona Rainbows around an eclipse are caused by light shining through water vapor. Very cool. #6 360-Degree Sunset: During totality, you see what looks like a sunset - in every direction! All of North America plus parts of South America, Africa, and Europe will see at least a partial solar eclipse, which is when the where the moon covers part of the sun's disk. Those who are viewing from the path of totality, where the moon will completely cover the sun and its atmosphere, will see a total solar eclipse. 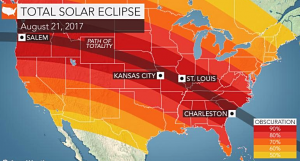 The path of totality, which is about 70 miles wide, will pass through portions of 14 US states, stretching from Lincoln Beach, Oregon to Charleston, South Carolina. Important! In order to view the Total Solar Eclipse directly, without incurring serious damage to your eyes, you must wear certified CE and ISO approved eclipse sun glasses. and preview what it will look like from your location! If you appreciate the resource, please help DemList with a Contribution HERE Today!